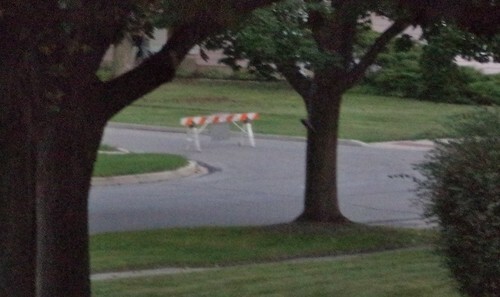 I live in a fairly quiet neighborhood of Wheaton. We're close to the train station into Chicago, but, for the most part, not much happens around here. That's really okay. I'm not sure I would enjoy living 3 blocks west or 2 blocks east, both of which are secondary north-south roads on which there can be a lot of traffic. So, it was with some interest that I received a letter right after Labor Day from our Park District. There was going to be a 5k race to benefit the FT Cares Foundation. Based in Wheaton, the foundation raises money to provide resources to other charities in the area. They called the run "Light the Torch" and you were encouraged to dress up in lighted clothing, carry lights or wear glow sticks, etc. 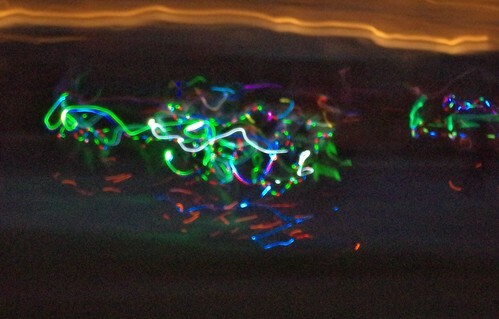 Each runner and walker was given a glow strip they could wear. The reason I received a letter about this was that the race course was right in front of my house. I live by the water/first aid station on the right side of the race route. We received another reminder, stuck in our front doors on Tuesday. 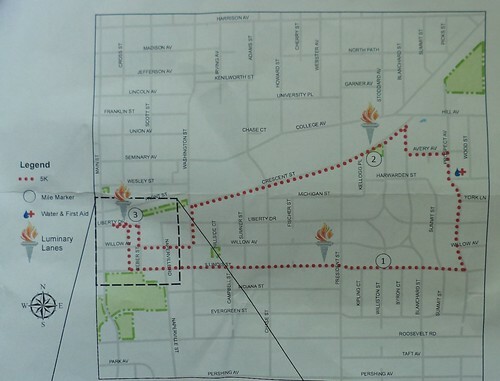 The race would start at 7 p.m. but the street would be closed at 6:30. We needed to remind people, and ourselves, of this so no one was on the race course. Any cars parked would be towed to side streets. The barricades were left at the street corners on Thursday. I've never watched a foot race. I had no idea what to expect. Neighbors had been talking all week about standing in their parkways and cheering, adding lights to the front of their homes since the whole idea of the race was to add additional lights. 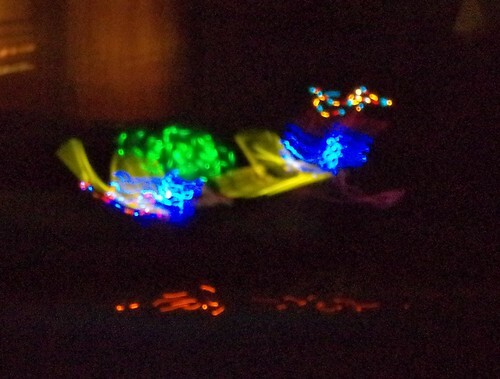 I noticed, when I got home, that some people north of me had luminaria along their section of the street. 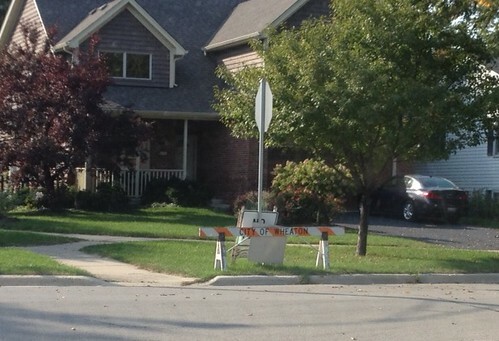 At 6:30, as stated, the barricades on the side streets went up. Neighbors south of me strung up Christmas lights. I thought, I could have done that, or put something in the front of the house. We knew the race would start at 7 to the west of us. We weren't sure how soon we'd start to see runners after the start. I decided to just sit on the front steps and watch. I had to find the Deep Woods Off to combat the mosquitoes, although I was surprised at how few there were. 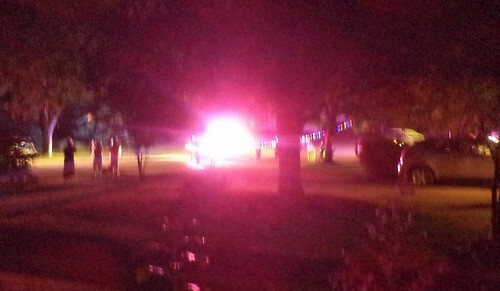 At 7:15, a police car came down the street. My little camera doesn't do well in low light situations. There is probably a setting for low light, but I couldn't find it right away. About 2 minutes after the police car passed, the first batch of runners came through. Most of them wore only the event issued light stick and that chartreuse-color shirt. Slowly, however, the colorfully decorated runners started showing up. There were family groups running and walking. There were friends and people with dogs or strollers. You can see that some people really took the "bring your own lights" suggestion to heart. It was fun to watch the race. I had a mug of tea and enjoyed a wonderfully mild September night. A walker was the last person to come by. She was followed by a police car. Neighbors cheered her as loudly as the first people to come down the street. The whole event took an hour and 15 minutes. The street was not reopened until 9:00 to allow all racers to clear the course. About 10 minutes after this walker passed my house, a car came down the street. 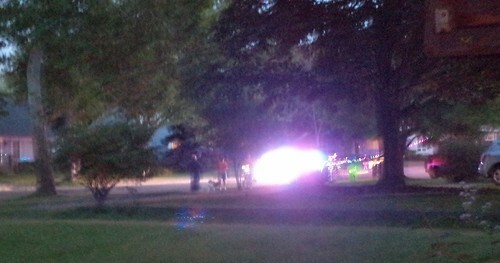 That car was followed, very quickly, by a police car and they were stopped just north of my house. I could hear the officer saying, "Those barricades are there for a reason ma'am." That's the time one goes back into one's house for a refill on the tea. If this happens next year and they use the same route, I need to put Christmas lights on my arbor. They couldn't have asked for a better night, which won't always occur. This was fun and a nice diversion to the usual life of the block.